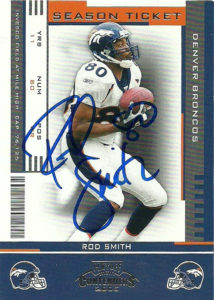 Rod Smith is considered one of the greatest undrafted wide receiver free agent acquisitions in NFL history. 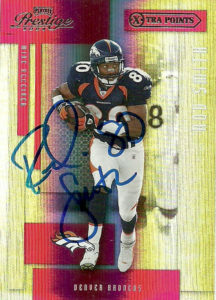 After going unselected out of tiny Missouri Southern State in 1994, Rod signed with the Denver Broncos. Rod spent the entirety of the 1994 season on the practice squad, while the Broncos were going through a slow overhaul at WR. A gifted receiver who displayed eagerness and unyielding work ethic, Rod felt he had to work twice as hard as other players, because not only did he come from a Division II school, he had to work his way off the practice squad. 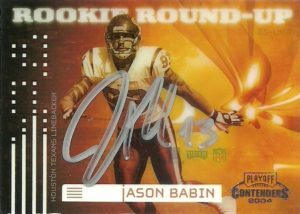 In 1995 he was promoted to the active roster, contributing primarily on special teams. In week 3, Rod posted his first reception- a 43 yard touchdown bomb from John Elway over the top of Darrell Green to win the game against the Redskins. The catch signaled the beginning of Rod’s arrival at the NFL stage. Throughout the 1995 season and the following year, Rod saw increased play time alongside Ed McCaffrey, as Anthony Miller was winding down. Rod played his first full season in 1997. 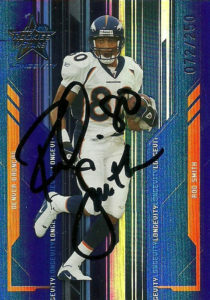 His ascension is critical in Broncos lore as he was able to help Denver win the Super Bowl in 1997 and 1998. Over the next 6 consecutive seasons he’d post over 1,000 yards receiving, including a career high 1,602 receiving yards in 2000, and 113 receptions in 2001. He’d also earn All Pro/Pro Bowl nods in both seasons. Rod made one more Pro Bowl appearance in 2005 after recording 85 receptions for 1105 yards and 6 TDs. Rod was on pace for another banner season in 2006 but suffered a hip injury. In the end, Rod had to have his entire hip replaced in 2007, which ended the promising wide receiver’s career too soon, as he owned nearly the entire Broncos receiving record books. As fans sit there and debate, there is no question to me that if Smith’s career continued, he’d be a shoo in for the Pro Football Hall of Fame. His numbers and wins for a receiver are on par with that of Jerry Rice. Unfortunately there is a logger jam of players at receiver going back years that may curtail his induction. In 2008, Rod was inducted into the Division II Football Hall of Fame. Soon thereafter, he also received honors from the College Football Hall of Fame (2009) and the Denver Broncos Ring of Honor (2012). 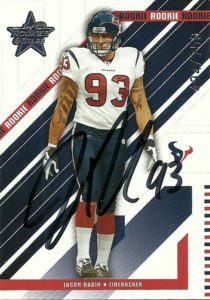 I was surprised to get Rod’s autograph on these cards. He also included a business card of his new self-help book, ‘The Rod Effect’ , which charts his life from rags to success outside of football.